The Community Learn to Swim Program has been at West River for over 30 years. We offer Red Cross swimming lessons for children and youth. All classes run for two week sessions, Monday – Thursday, with Friday used only if a make-up day is needed. All children must be fully potty trained. Children in Levels 1-4 must be able to stand alone in 3 feet of water. Preschool students are accompanied by a parent at all classes and must be potty-trained (no swim diapers). NEW for 2019! Level 1 & Level 2 classes will each have their own time slots, there will not be any evaluating on Monday to determine levels – Parents please register your child for the level you feel appropriate based on level descriptions. ALL classes are 30 minutes long. This level is designed for parents/guardians of children up to 5 years of age (that are fully potty trained) to actively participate in their kids’ swim lessons. 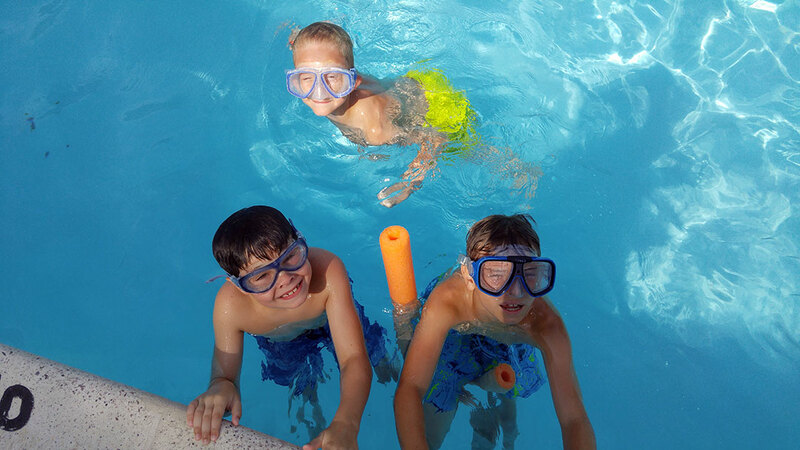 Basic skills of entering and exiting the water, floats and bubble blowing will be taught. This not only helps increase the child’s comfort level in the water but can help parents understand the process and practice skills with their kids in between classes. This level is designed for those first timers or those afraid of the water. Basic skills such as water adjustment, floats and breath control will be taught. No prerequisites other than the height minimum of being able to touch in 3 feet of water. This level is designed for those who are comfortable in the water and have some basic skills. Students will be taught swimming using combined stroke on front and back, bobbing, treading water and front and back glides. This level is designed for the student who has mastered the skills in Level 2. Students will learn the front and back crawl, glides, kneeling or standing dive, rotary breathing and butterfly kick and body motion. This level is designed for those who want to improve their confidence in strokes and other aquatic skills. Students will learn diving, elementary backstroke, breaststroke, butterfly, feet first surface dive and front and back crawl.